"Na een poosje kwam het meertje in het zicht..." Watercolour on paper. Page 42 from Tom Poes vertellingen, Bezige Bij, 1949. 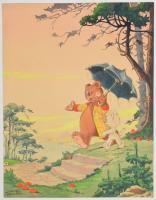 Sir Oliver and Tom Puss walk towards the lake while holding an umbrella. 28 x 21.5 cm. Iconic drawing from one of the finest picture books from Toonder's heyday. 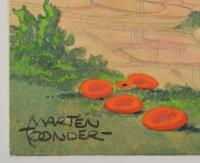 Colours well preserved, signature Toonder bottom right, stamped "Marten Toonder Studio's Reguliersdwarsstr. 9, Amsterdam-C Telefoon 35867" and "Please, return the Original drawings as soon as possible in undamaged condition" on reverse. Of the watercolours from the book a handful of copies are known. This hitherto undiscovered copy was purchased privately decaded ago and for years decorated a child's bedroom.